ClotCare's senior editor, Henry I. Bussey, Pharm.D., was recently honored with the 2006 Pinnacle Award given by the American Pharmacists Association (APhA) Foundation. Dr. Bussey was selected for this award, in part, for his work on ClotCare. In the interest of full disclosure, I should point out that Dr. Bussey is my father (see http://www.clotcare.com/clotcare/aboutclotcare.aspx). Thus, rather than brag about my dad, which I certainly could do, I have provided a press release below that describes the award, including information about Dr. Bussey and the recipients from the two other award categories. WASHINGTON, DC - The American Pharmacists Association (APhA) Foundation announces the winners of the ninth annual Pinnacle Awards: Recognizing Contributions to Health Care Quality Through the Medication Use Process. The awards dinner will be held on June 13, 2006 at the Smithsonian National Museum of American History in Washington, DC. The Pinnacle Awards are administered by the APhA Foundation’s Quality Center and are made possible through a grant from Wyeth. These awards were created by the APhA Foundation’s Quality Center because the topic of medication use is extremely important and timely in today’s health care environment. Morbidity and mortality associated with improper medication use is a major public health problem, resulting in significant disability and up to 100,000 deaths each year. An estimated 177 billion dollars is spent annually on preventable hospitalizations, lengthened stays and/or prolonged treatment as a result of prescribing contraindicated therapy, drug-drug interactions, adverse drug reactions, duplication of drug therapy and/or errors in drug administration. According to William M. Ellis, APhA Foundation Executive Director and CEO, "The 2006 Pinnacle Award recipients have made tremendous contributions toward creating a health care system where there is true collaboration and teamwork between all stakeholders. All the winners have taken risks and tried new ideas that have led to improvements in our health care system. Through their hard work and dedication, they serve as both an example and inspiration to everyone who is interested in optimizing medication use." The Pinnacle Awards recipients are recognized for pioneering innovative ways to improve the medication use process that increase medication adherence, reduce drug misadventures, improve patient outcomes, and increase communication between all members of the health care team. Henry I. Bussey is being honored for his clinical research in cardiovascular therapeutics and antithrombotic therapy where his work was instrumental in the adoption of the Internal Normalized Ratio (INR) for warfarin monitoring. Kerr Drug, Inc. Clinical Services is receiving this award based on their tremendous accomplishments in redefining community pharmacy practice and improving patient care. This award is being given to recognize the collaborative efforts of federal, state, and local governments, a national foundation, several private businesses, and national organizations of physicians and other health professionals to create an online service to ensure that evacuees of Hurricane Katrina received life saving medications. The APhA Foundation is affiliated with the American Pharmacists Association, the national professional society of pharmacists in the U.S. The APhA Foundation, a nonprofit organization based in Washington, DC, works to design solutions to medication use problems in America. The APhA Foundation’s mission is to improve the quality of consumer health outcomes affected by pharmacy. Dr. Bussey is a tenured Professor in the College of Pharmacy, The University of Texas at Austin and Clinical Professor, Department of Pharmacology, The University of Texas Health Science Center at San Antonio. He is also Clinical Director, Anticoagulation Clinics of North America in San Antonio, Texas; co-founder of ClotCare Online Resource, an interactive website that disseminates new information related to anticoagulation; consultant to The ClotCare System, an on-line management system; and founder of the Institute for Therapeutic Research, Inc. (dba Genesis Clinical Research). Dr. Bussey completed his B.S. in Pharmacy at the University of Georgia in 1971 and his PharmD with a concurrent Clinical Pharmacy Residency in Internal Medicine at the University of Texas Health Science Center at San Antonio in 1978. From 1978 to 1982, Dr. Bussey served as Coordinator of Clinical Pharmacy Services and Medical Staff Clinical Pharmacology Consultant, Richland Memorial Hospital, Columbia, South Carolina; and Assistant Professor, College of Pharmacy and School of Medicine, University of South Carolina, Columbia, South Carolina. In 1982, he joined the faculty at The University of Texas at Austin and the University of Texas Health Science Center at San Antonio (UTHSCSA) where he was instrumental in establishing an outpatient clinical research unit and served on the IRB. Throughout his career, his clinical research has been focused on cardiovascular therapeutics (including hypertension, diabetes, and hyperlipidemia) and antithrombotic therapy where his work was instrumental in the adoption of the Internal Normalized Ratio (INR) for warfarin monitoring. His work identifying and verifying the unreliability of using the prothrombin time to monitor warfarin led to the international acceptance of the INR as the monitoring parameter for warfarin therapy. This led him to be invited to serve as a member of the American College of Chest Physicians Consensus Conference on Antithrombotic Therapy. He is the only pharmacist to serve as a member of the expert consensus panel, and he has served in this capacity on four different revisions of the guidelines. 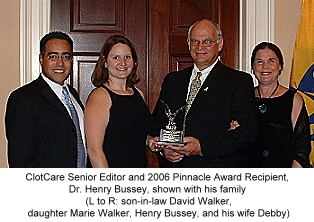 Dr. Bussey has over 100 publications, has completed over 40 clinical trials, serves on the editorial and review boards for several medical and pharmacy journals, and has been elected a Fellow in the American College of Chest Physicians (2000), the American Heart Association, Council for High Blood Pressure Research (1995), and the American College of Clinical Pharmacy (1987). He has been innovative in establishing pharmacist managed clinics for anticoagulant monitoring. He has established these clinics in both the public and private sectors, and has published outcomes research supporting that these clinics decrease the complication rates for anticoagulation treatment. Dr. Bussey has also been a leader in educating and training pharmacists in anticoagulation care management. He has done this work with student pharmacists, residents, and practitioners. He has received several grants to support pharmacist training in anticoagulation, and has trained over 50 pharmacists nationally and internationally. He has also served as a member of the College of American Pathologists Consensus Conference on Laboratory Monitoring of Anticoagulation. Dr. Bussey helped form the Anticoagulation Clinics of North America in 1994 and ClotCare.com in 2000; founded the Institute for Therapeutic Research, Inc. (dba Genesis Clinical Research) in 2002; and helped develop The ClotCare System in 2005. 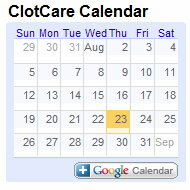 The ClotCare System is an online software system that is designed to help clinicians manage anticoagulation therapy more efficiently and safely. This allows patients to perform self-testing of the INR at home, or anywhere, and enter their information online and receive instructions back from their clinician. Dr. Bussey has demonstrated himself to be the preeminent pharmacist internationally in the development and provision of clinical services for individuals receiving anticoagulation therapy and is an icon for improving patient care. Kerr Drug, Inc. is a regional pharmacy chain with more than 100 stores located throughout North and South Carolina and headquartered in Raleigh, NC. This pharmacy-focused company’s goal is to be true to its mission statement of being a health care destination; a market leader in the clinical pharmacist delivery of quality dispensing services, Medication Therapy Management (MTM) services, preventive health care programs by KDI Clinical Services (KDICS), and a wide variety of durable medical equipment and health-related products provided by professional, experienced staff. KDICS is a team of clinical pharmacists who practice in Kerr Health Care Centers, located in approximately 15% of Kerr Drug Stores throughout North and South Carolina, as well as employer worksites and medical practices. The KDICS staff includes residency-trained pharmacists with advanced training and certifications in diabetes, hyperlipidemia, hypertension, asthma, chronic obstructive pulmonary disease, smoking cessation, osteoporosis, and immunizations. KDICS recently gained recognition from the American Diabetes Association (ADA) for its interdisciplinary Diabetes Self-Management Education (DSME) Program at five locations and is currently in the application process for five additional sites. These certifications, among others, allow the KDICS team to participate in a mix of activities including disease prevention, detection, monitoring, and management screenings, immunizations, and disease/medication management in-store and/or onsite at employer groups and community organizations. The dedication of KDICS to educating future leaders in clinical community pharmacy practice is evidenced by its academic-practice relationships with three North Carolina Schools of Pharmacy: University of North Carolina at Chapel Hill, Campbell University, and Wingate University. These relationships have enabled the growth to date of six Community Pharmacy Residency sites within the Kerr Health Care Centers across the state. The residency program demonstrates a commitment to practice innovation and quality patient care. As a measure of success over the past seven years, KDICS has been able to grow and expand, supported in large part by the talent of its past residents. KDICS also provides MTM and disease state management for many self-insured employer groups including, but not limited to, the City of Asheville, Mission Hospital, Blue Ridge Paper, Vanity Fair Corporation, Southeastern Container, Sullivan County, and Glen Raven Textiles. KDICS pharmacists manage nearly half of the Asheville Project participants and have utilized the positive outcomes from the study to promote MTM growth to other employers. KDICS has actively shared its work within the community pharmacy profession in an effort to advance practice. Active involvement in the Chain Drug Consortium, a group of ten regional pharmacy chains whose formation Kerr Drug lead, affords KDICS an opportunity to provide guidance and information about clinical services to those organizations whenever requested. Kerr Drug has, by request, hosted many independent, regional, and national chain pharmacies in a unique "preceptorship" program. This program includes visits to Kerr Health Care Centers and corporate office to receive detailed, "hands-on" information and experience in building and maintaining both a successful clinical services division and Community Pharmacy Residency Program. When the Centers for Medicare/Medicaid Services (CMS) were challenged with crafting language around MTM as part of the Medicare Modernization Act (MMA), they made a field visit to a Kerr Health Care Center to observe KDICS as an MTM Best Practice model. The pioneering efforts of Kerr Drug to advance the profession of pharmacy and patient care have led to the creation of a first-of-its-kind facility focused solely on the complete health of its patients, located in Lenoir, North Carolina. This facility is set to revolutionize the way North Carolinians receive pharmacy and healthcare services. The flagship Community Healthcare Center offers expanded pharmacy services, and provides a variety of private, one-on-one patient services, intervention and education performed by health professionals such as a physician’s assistant, pharmacists, weight loss/nutritionists, respiratory therapists and other specialists. A complete line of health screenings are available, including cholesterol, bone density, artery disease, glucose, respiratory, blood pressure and many others. For patients with otherwise limited access to these services, the Center represents a convenient and cost-effective way to receive professional preventative healthcare. The Center is also equipped with a state-of-the-art "Healthy Living" durable medical equipment section for patients needing walkers, hospital beds, mobility and safety equipment, and home health care items. Through Kerr Drug’s commitment to quality, they are redefining community pharmacy practice and improving patient care. At the time of Hurricane Katrina’s impact, approximately 40 percent of the more than 1.5 million evacuees were taking a prescription drug. As evacuees dispersed across the country, many left home without their medications or prescription information. With a goal to protect these evacuees and prevent medication disruptions in the aftermath of one of the nation's deadliest hurricanes, KatrinaHealth.org was designed as a single source of comprehensive medical and prescription histories for healthcare providers treating evacuees. Through KatrinaHealth.org, authorized pharmacists and doctors were able to obtain medication records of evacuees to renew prescriptions and better coordinate care. Within two weeks of the hurricane’s landfall, a preliminary beta site was launched for use by registered healthcare providers in key shelters in Mississippi, the Houston Astrodome, and at three hurricane-impacted VHA bases. Less than one month after the hurricane’s landfall, the full-scale launch of KatrinaHealth.org was executed, providing information on evacuees from Mississippi and Louisiana to registered healthcare providers across the country. In addition to a 90-day snapshot of evacuee prescription histories, the robust system alerted users to patient allergies and provided a medication identification component that allowed providers to identify tablets and capsules by querying the database for characteristics such as color, shape, or unique markings. Privacy and security were central to the design of KatrinaHealth.org. To ensure patient confidentiality, KatrinaHealth.org was only accessible to authorized healthcare providers and pharmacists who were providing treatment or supporting the provision of treatment to evacuees. Tools were in place to prevent unauthorized access. Audit logs of credentialed users including records accessed were rigorously maintained and reviewed. In addition, consistent with many state privacy laws, highly sensitive personal information was filtered from the site. The expansion of the program to include all hurricane evacuees from Mississippi and Louisiana required an unprecedented collaboration of private companies, public agencies, and national organizations. Many players worked together to ensure the most comprehensive prescription history information possible was available for the more than one million impacted lives. With the assistance of federal, state, and local governments, KatrinaHealth.org was operated by a national foundation, several private businesses, and national organizations of physicians and other health professionals. This award is based on submissions by Informed Decisions LLC, Tampa, FL and SureScripts, Alexandria, VA. Informed Decisions, LLC, a wholly-owned subsidiary of Gold Standard, Inc., is a pharmacist-led firm that provides a full array of strategic health information technology services. Within five days of the storm’s impact, the company had expedited implementation and rolled out a web interface, providing authorized users in shelters, pharmacies, and healthcare facilities with online access to information critical to the care of evacuees. Informed Decisions then developed the front-end web interface that became KatrinaHealth.org. SureScripts was founded in 2001 by the National Association of Chain Drug Stores (NACDS) and the National Community Pharmacists Association (NCPA) to improve the quality, safety, and efficiency of the overall prescribing process. The SureScripts Electronic Prescribing Network is the largest network to link electronic communications between pharmacies and physicians, allowing the electronic exchange of prescription information. SureScripts provided the network to electronically link pharmacies and doctors to renew prescriptions, prescribe new medications, and coordinate care for evacuees (of Hurricane Katrina). The collaborative effort of those who helped create KatrinaHealth.org provides a sense of hope and security for inevitable future disasters.